Just a short drive from the city of San Francisco stands the tech giant city of San Jose California. 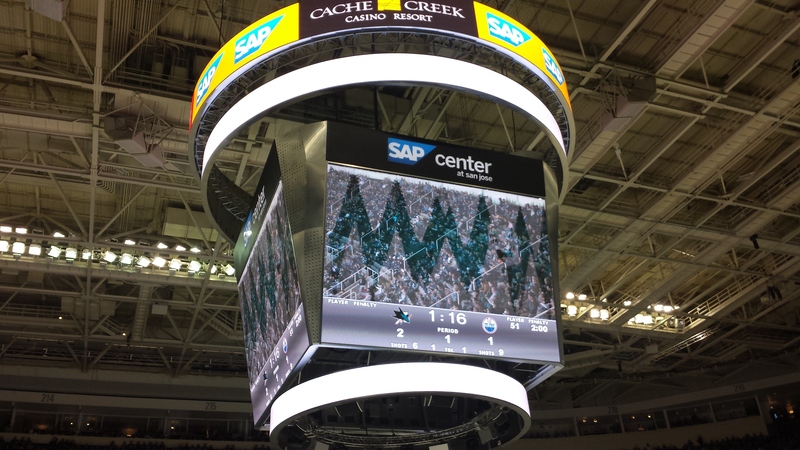 Thriving on the advent of technology and relishing in the proximity to some of the world’s best produce and wine the city of San Jose has grown to also incorporate their love for sport, and especially their love for hockey. 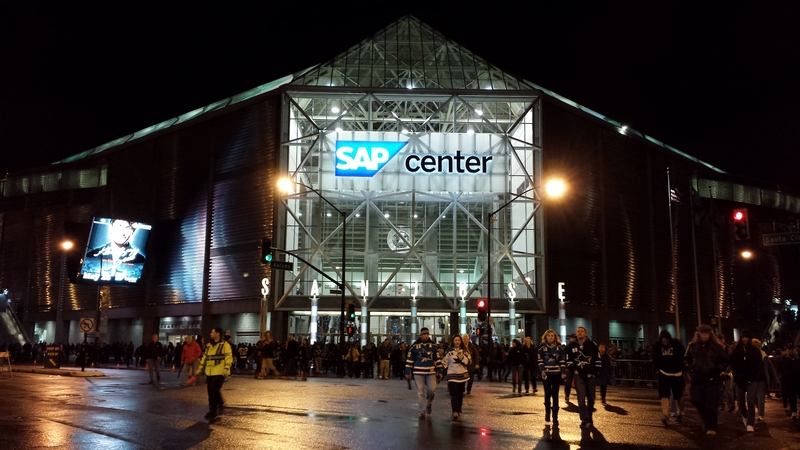 The San Jose Sharks have been a team to beat season after season, and finally in April of 2014 we were able to cross this arena off of the list. Going into this game, we were unsure what to expect. The Oilers had been of course performing abysmally for years, the Sharks were doing quite well, as they had been for years, and other than the fact that the home team skated out from the mouth of a shark, I have to admit, I didn’t know much else about San Jose and their hockey market. The first thing my husband and I noticed were of course how many people were sporting hockey jerseys walking into the arena. It is still hit and miss in some markets, and what you see on television of the lower bowl isn’t always the best representation of what is really going on in an arena. 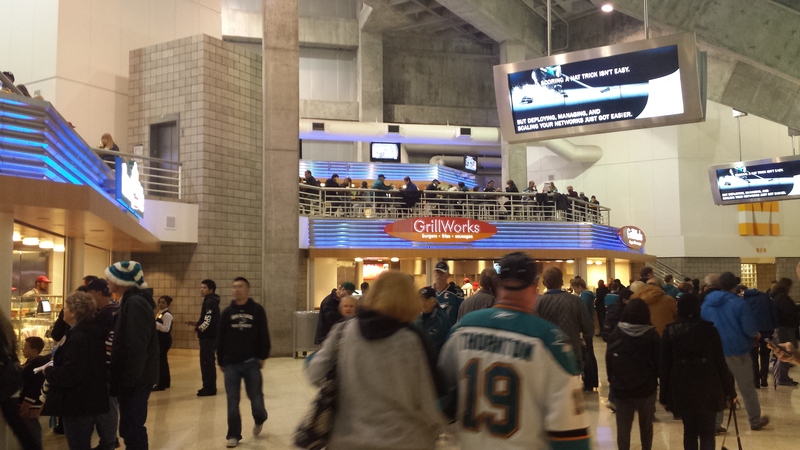 A sea of teal and purple spread out in front of us walking into the SAP center, filled with smiling faces, friendly shouts back and forth and the odd Oilers jersey mixed in, just for good measure. 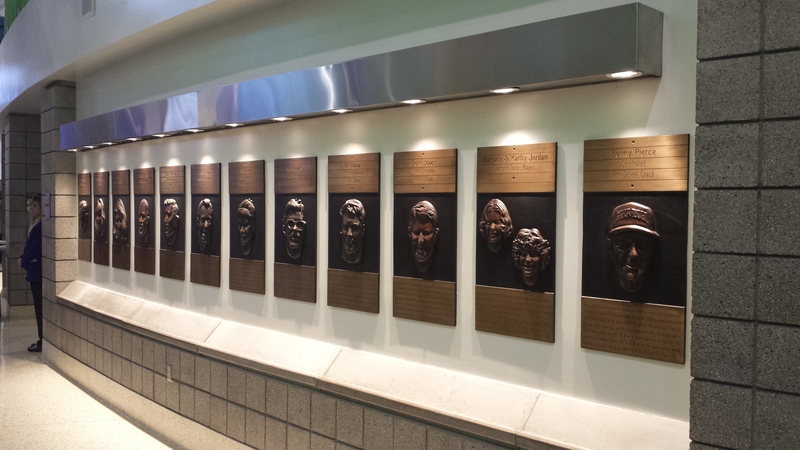 The arena itself reminded me a little of the Tampa Bay Amalie Arena when walking up to it. It was brightly lit and had tall windows on the outside. It also appeared to be close enough to things, but that it was still a drive to destination, also like Tampa Bay. The concourses were wide and filled with a variety of bars, beers and food stations. All of the ushers were easily identifiable in purple blazers and always asking if you needed assistance, directions or any tips. Friendliness was also felt from the fans in the building. 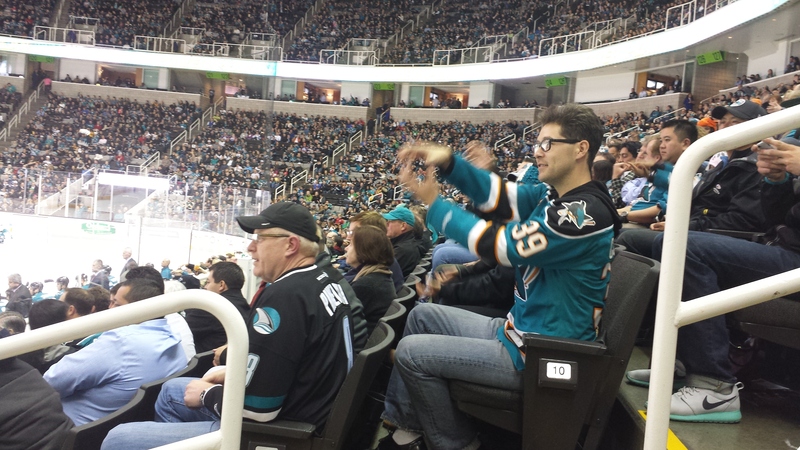 My husband’s Mike Brown Oilers jersey got quite a lot of comments, as Brown was having a good year with the Sharks, and further pointed out how passionate and knowledgeable the fans in San Jose are. During the game, the fan interaction was fantastic. 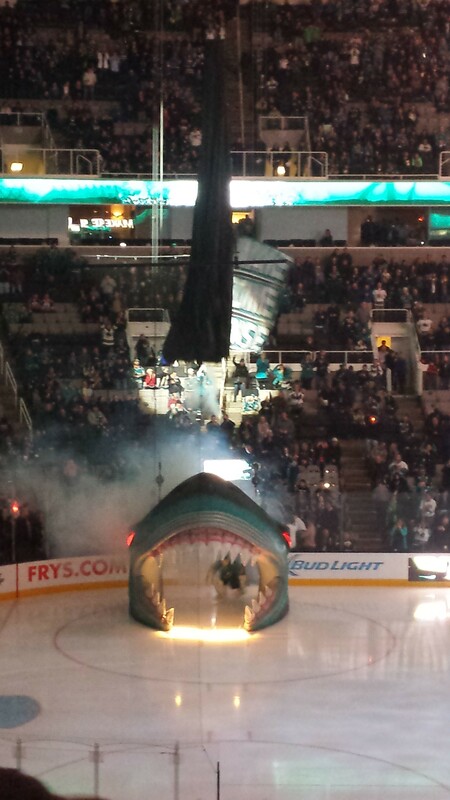 Penalty calls caused the arena to erupt with fans opening and closing their arms, mimicking a shark biting along with the iconic shark ditty we all know and love. Dun uh, dun uh. This reminded me a lot of the “fins up” interaction at a Miami Dolphins game. It may seem like a minor thing, but something else to keep your fans entertained and in the game is never a bad thing. Some may find it cheesy, or too childlike, but the fans loved it. And this interaction, this chance to participate gets you talking to your seat neighbour, it makes you more aware of people around you and fosters a sense of community, encouraging friendliness and conversations. You’re doing it right San Jose. You’ve created a welcoming environment, perfect for visitors, for promoting and maintaining a fan base and that’s not something that every city can say. 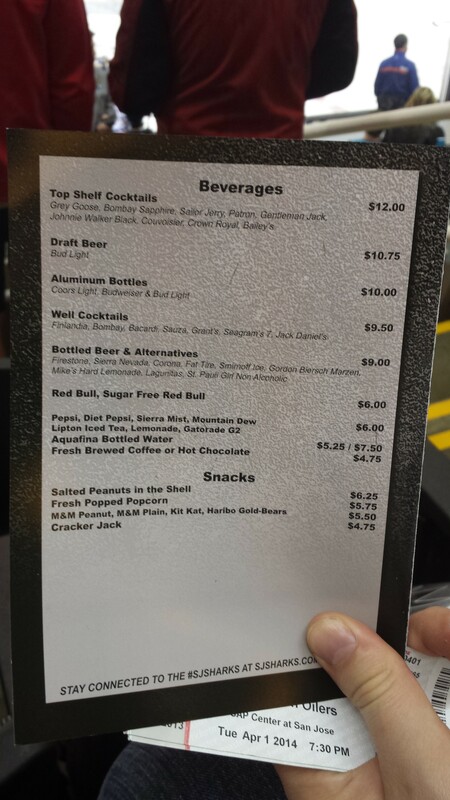 One closing thought though... what's up with these drink prices? We hit three more arenas in the next week, that is going to take me to 20 arenas to see Oilers games, not counting the arenas I’ve seen games not including the Oilers, or arenas where I only covered the draft, no game. The Oilers nearly won this game in San Jose, it was quite exciting. It’s also nice to see them starting to turn things around.